Comfortable room and helpful staff. A few minutes to the tram station. Easy traveling to the city center. We loved it, and thought the accomodation was great. Would have been good to have another sofa option in the lounge for evenings - the sofa bed did not suit 5 adults and 1 child. Our experience was good as we were only staying overnight and needed accommodation that would meet our needs at the best price. I have stayed here before. It was excellent then and is excellent now. Fabulous value, terrific location, clean quiet rooms with very good facilities. Highly recommended. This was a bargain considering location. The staff were friendly and supportive. Stayed here many times. Safe, secure, easy convenient and great value for money right at the city's footstep. Very pleasant and conveniently located. Staff were very helpful. I had a relaxing stay there. Thank you. The only downfall in amenities were the shower, which didn't work, and the bathtap, which needed replacing (was spilt down the side). We had room 26. Nice and quiet, friendly staff, good price but I paid for 1 too many people by mistake online! I found the staff very helpful and good value for money. 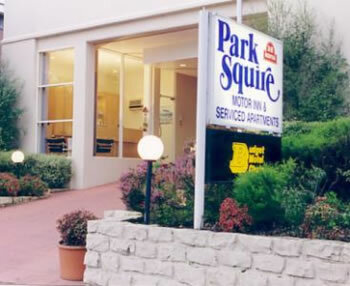 Third straight year we have stayed at Park Squire during the Australian Open Tennis. Overall very satisfied, room was ready early and we were able to store out luggage until we needed to leave at 6 pm. Very comfortable apartment and great position. Great value for money. Staff extremely accommodating and helpful. Prompt service and very pleasant. Good. Does get noisy with doors slamming shut from the other apartments. Very good location with easy access to public transport, very easy to get into and out of city. Very enjoyable. Closed to Melbourne CBD and very good value. Very pleasant stay . Easy access and family friendly. Very convenient location for us visiting relatives to the North and West of Melbourne. The rooms look a little tired but they have all of the essentials for a comfortable stay. Room is pleasantly quiet despite the busy location. Overall the apartment was very good. Although the toilet needs fixing as it always ran when flushed and would not stop if the buttons were jiggled. The fridge also needs looking at as it leaked. Other than that everything was good. Nice quiet location but close to trams and trains. Definitely value for money, although not much in way of food around the area and no facility in room to heat food. Always an affordable and eesy stay. My experience was overall very good indeed. The location and proximity to tram station made travelling to the city convenient and easy. The room was large and comfortable for the four people staying and the kitchen was nice too. Overall good, some miscommunication Coffee & tea no milk?? not to far out Easy to jump On a tram And right On The main stretch.